As the wealth of information available on the Internet continues to grow exponentially — second by second — our challenge is not merely to find information, but to sift out the truly useful and reliable information we need to complete a task or accomplish a goal. Three new tools are available (or will be released very soon) to help save you time in tracking down public records, demographic data, research and statistics for your organization’s reports and decision making. 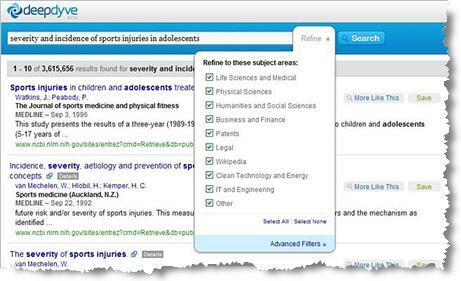 DeepDyve is a specialized search tool for finding “high quality information from trusted sources” in the “hidden archives” of the Web — databases, documents, journals and subscriber-only archives that are not normally indexed by conventional search engines. With DeepDyve, the content is your query. You can still type in a few words to begin a search, but DeepDyve allows you to copy and paste entire sentences, paragraphs, or articles. Results come back automatically arranged in organized folders. DeepDyve simultaneously returns results from public and private information, either together or separately. To go deeper and find additional content, click on “More Like This” for any result and find all related articles. At the moment, DeepDyve specializes in Medical and Life Sciences sources, but the intention is to expand its coverage into other topic areas as the product develops. You may find it takes a bit of practice to learn to make the most of DeepDyve’s unconventional text search methods, but advanced filters make it possible to narrow a search quite effectively, and the ability to save and share your search queries will be useful. Google’s data search is not so much a new tool and a new feature of the Google search engine that makes it easier to find and compare public data. The really exciting part of this new feature is the ability to create and customize an interactive graph to help you visualize the data, and easily share your graph with others. So far, the public data search feature only applies if you’re looking for population data or unemployment rates for American states and counties. As the official Google blog announcement explains, the data they’ve included in this initial launch, produced and published by the US Bureau of Labor Statistics and the US Census Bureau’s Population Division, is “just a small fraction of all the interesting public data available on the web” and there’ll be a lot more to come. Wolfram Alpha is a new “answer engine” developed by British physicist Stephen Wolfram. This one’s not quite out of the box, but due to launch any day now — Insiders got a preview at Harvard University last week, and ReadWriteWeb has posted screenshots of Wolfram Alpha. A short YouTube video of Wolfram’s presentation gives examples of how the tool might be used. Touted in the technology news media as the next revolution in search engine technology, Wolfram’s “computational knowledge engine” is not intended to take on conventional search engines head-to-head. The engine is designed using extremely advanced algorithms so it truly has the ability to actually understand what you are asking for. So if you type “How many protons are in a lasagna for six people?”, the system will be able to recognise, interpret, connect the pieces of available information and give you the answer to the question—provided the question has an answer, of course. I find this fascinating. An engine that could actually interpret your questions and the information available to give you specific answers is the Holy Grail of information technology. Wolfram doesn’t claim Wolfram Alpha will fully achieve this, but he and other scientists are claiming this is a huge step towards that goal. We will have to wait and see how well it works—before Google buys it. What search tools do you rely on? Specialized search engines, human-edited directories, ratings systems, social bookmarking sites, and personal recommendations via social media are among the many ways we try to get a grip on the information overload. No doubt this is only the start of a new wave of new ways to organize, retrieve, visualize and share publicly available data. The recent high-pitched buzz in Internet technology circles (with the public release of DeepDyve and of Google’s data search feature, and the public preview of Wolfram Alpha) brings me back to one thought, however — maybe what the Internet needs is a good Librarian!